Why do people have trouble staying focused? Staying focused eight hours straight every day is a goal that most people strive for, but no matter how hard we try, it is impossible. Why? Experts say that the average attention span in adults is between 20 and 40 minutes. Even though our preferred goal is to stay focused for eight full hours a day, our brain is not developed to function that way. The opposite often occurs when we try to stay on task for a long period of time – that is, we get easier distracted. Market research firm uSamp found that 53% of people waste at least one hour a day due to all types of distractions. Collaboration tools that are supposed to increase productivity at work, continuous noises, overflowing email inboxes and the frequent feeling of being fatigued, let our minds keep wandering off. In addition to the loss of hours, our body takes a toll when trying to work without proper breaks. People often turn to coffee to keep from getting tired, this can lead to sleep insomnia. According to the National Institutes of Health, 50 to 70 million Americans suffer from chronic sleep disorders. In order to function properly adults need between 7 and 9 hours of sleep each day. Many don’t get the necessary amount of sleep needed and it starts affecting their concentration. So, what can you do to maintain the level of concentration you need to get all your work done? Studies show that taking frequent breaks helps to increase focus and productivity tremendously. Many employees don’t take enough breaks during the day, some don’t even take any at all but that doesn’t seem to increase the amount of work they get done. People that don’t take breaks tend to get distracted easier than people who break frequently. Draugiem Group, a social networking company based in Latvia has demonstrated this by using an app called DeskTime. Employees were to work for 52 minutes and then take a 17 minute break. During this break employees did things completely unrelated to work and without the use of electronics, like going for a walk, chatting with co-workers, or reading a book. The problem is that many fear to appear lazy or unproductive. It is important that employers support this method and show their employees that it is ok to take these breaks. In the end the whole organization will benefit from this approach. If you have the ability to exercise during your breaks, do so. It’s been proven that moving around will increase concentration levels – even if you just go for a walk outside. Dr. John J. Ratey a clinical professor of psychiatry at Harvard Medical School explained how a protein called brain-derived neurotrophic factor (BDNF) is released, which plays a role in the improvement of cognitive health. The image below shows best the level of activity in the brain of a person in a serenity state versus a person who has been active for 20 minutes. 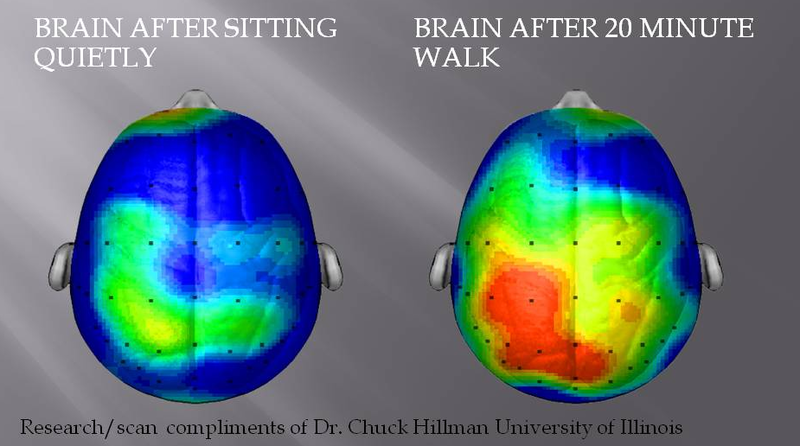 In addition to what happens in the brain, exercising regularly benefits the whole body – leading to lower health risks. Nutrition can make a significant difference on concentration capacity, especially when consumed at the right timing. A study by the International Labor Office shows poor diet can impact up to 20% of work productivity. It is very common that office cafeterias don’t offer a balanced meal selection. In other cases employees only have 30 minutes and run to the next Fast Food restaurant. Some may underestimate the importance of the right nutrition and their connection to mental and physical functions. Of all nutrients water is probably the most important; studies have shown that not drinking enough water will not only dehydrate your body but also decrease your level of focus and short-term memory. Other foods that increase energy and concentration include blueberries, fish, avocado, green tea, and dark chocolate. Making a to-do list is one of the most effective ways to get work done and stay on tasks. However, many seem to struggle creating a list and following it. There are too many distractions during the day that keep us from staying focused. Making a list will not only help you stay organized but also help finish the work you intended to do. Here are a few tips on how to write and follow the to-do list effectively. Writing your to-do list the night before will save you time and energy, which you will need in the morning to be most productive. Take a look at your calendar, check appointments that are coming and determine what you need to for these meetings. Make a random list of all the things you have to get done and then prioritize, listing the most important tasks first. Check your email inbox when you arrive at work. Set a timeframe, like 30 minutes to read and respond to emails. After that don’t check it again for at least an hour or until you finished the first important task on your to-do list. Checking our email inbox is one of the most distracting things that keep us from focusing. As soon as we open our inbox we see an important email and feel the need to respond to it. Before we know it we will respond to the next, and the next, and the next, until we forget what we were actually concentrating on. Setting a realistic timeframe is often difficult; people underestimate the time they really need to finish a task. So, be realistic and add an extra 30 minutes if you are unsure. It is better to have more time than to feel rushed. The same applies to emails, decide on how often you want to check your emails and set aside a certain time to respond to them. Before you leave go over your to-do list and make sure you finished everything. Then start your new list for the following day. Especially in the afternoon people tend to get groggy and crash easily. If that’s the case you should try Clarex. Compared to caffeine containing beverages it will keep you focused without the crash effect. If you do prefer to drink coffee you should try to drink it in the morning only. Generally, caffeine stays in your system for about 5 to 6 hours before it starts to wear off. Drinking coffee early in the day will decrease the chance of insomnia later on at night. Clarex will also help prevent caffeine jitters that tend to plague many coffee consumers. Overall people’s ability to stay focused is limited. Scientists have proven that the human brain can only concentrate for a short period of time like up to 52 minutes. It is just a matter of us learning how to be more productive by taking frequent breaks, moving around, staying organized, making lists etc. There are many ways one can return to a good level of focus and the ones above are only a few.